Most of the marginal and poor farmers of Assam believe in single cropping. It is a familiar scene in rural areas of Assam to find the fertile agriculture land lying abandoned immediately after the harvesting season of ‘Aghon’. The multiple cropping cultivation system is yet to be adopted by the rural farmers except a few ones due to the indifferent attitude of the farmers and the government or the State Agriculture Department. Even the so-called social organizations have also miserably been failed to create a proper and suitable atmosphere to inspire and encourage the younger generations in getting involved in scientific agriculture practice and to make themselves grow as agro-entrepreneurs. The scenario of Darrang district is also not an exceptional one. Despite such discouraging picture, a handful of youths of the district have come forward to dedicate their precious time for agricultural farming that too adopting the multiple crop farming. Jyoti Saikia of Ram Gaon near Mahaliapara have successfully been able to make their presence felt in the field of agriculture not only with multi-crop farming, but for their deep involvement in organic farming. Darrang Deputy Commissioner Ashok Kumar Barman – who has already become a ‘guiding spirit’ for the agro-entrepreneurs of the district, few days back, taking a serious note on the age old practice of allowing the fertile soil left abandoned, had made an appeal before the youths of the district not to leave a single plot of land abandoned to make it ever green field of agriculture products. A section of determined youths, being highly motivated and inspired by the clarion call of the Deputy Commissioner, promptly responded to it and got prepared to start a new ‘green revolution’ in the district. Transforming in Rural’ (DASTAR). Leader of the ULFA’s pro-talk faction Pranjit Saikia has extended all help and guidance to this NGO with a view to unite all the youths of the district irrespective of their religion, language, caste and creed under a single platform without affiliation to any political party. “Our aim is to stop the single crop farming and to utilize our fertile land by multiple cropping farming. We are not going to abandon our land immediately after the harvest of the golden paddy and we are determined to initiate organic farming,” said secretary of DASTAR, Ramen Deka while talking to North East Now on Saturday afternoon at the proposed site of 50 bighas of land at Ramhari where their tractor has been busy in preparing the land to start farming of high yielding variety of potato. “Enough has already been done in the State in the name of fruitless agitation. Though late, yet it is the high time that the younger generation should get involve in agriculture farming and it is none but only agriculture farming to make our Assam a prosperous state and to make us self sufficient,” said Ramen Deka with a feeling of deep confidence. The DASTAR this year has decided to start potato cultivation in a plot of 150 bighas of land of which 50 bighas in Ramhari area and 100 bighas in Mahaliapara and already has made the lease agreement with the owner of the land. 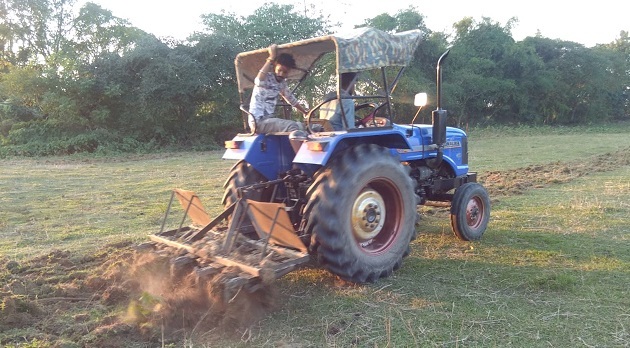 Ajay Deka, a young media person hailing from village Balipota who is also a member of DASTAR is also very much hopeful to initiate a practical motivation among the youths of the district and to get them involved in the agriculture farming utilizing the new agricultural technology.